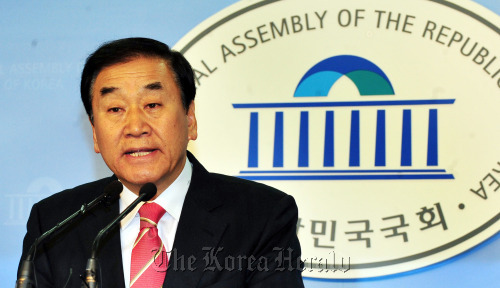 The ruling Saenuri Party’s feud over election nominations escalated further as leading members of the pro-Lee Myung-bak faction took aim at the party leadership. Rep. Lee Jae-oh, the most influential pro-Lee figure within the party, held a press conference Thursday and broke his long silence, publicly reproaching the leadership of Rep. Park Geun-hye. His forthright comments led to speculation that the pro-Lee group could defect from the party to form an independent alliance or join the newly-formed K Party. “The leadership should stop using nomination as a means of political retaliation,” Lee said. The “retaliation” is in reference to when pro-Park figures claimed that pro-Lee members deliberately excluded them from nomination shortly after President Lee’s election in 2008. The former special affairs minister earlier confirmed his candidacy in the northern Eunpyeong-B constituency, but later spoke out as most of his closest aides were unexpectedly ruled out of nomination. The list included Reps. Chin Su-hee and Kwon Teag-ky, as well as former special affairs vice minister Kim Hae-jin. He refrained from speaking further, largely in consideration of nominations yet to be made in the crucial Yeongnam region, where most pro-Park figures are located. “The leadership should, at least, open the judging processes to those who failed to make it into the top 75 percent,” he said, pledging to clarify his final stance once all nominations are finalized. The move of the leading pro-Lee lawmaker sparked a response from within the party. “We shall open the nomination judging standards in detail, if necessary,” the party’s secretary-general Rep. Kwon Young-se told reporters, shortly after Lee’s press conference. It was the earlier stance of the nomination screening committee that it was unnecessary to reveal detailed data on individual candidates. The disappointed pro-Lee members are expected to impact the party’s election results, should they decide to defect en masse or join the K Party. Also, observers noted that the party might not simply ignore the voice of leading pro-Lee members such as Lee, as well as Reps. Chung Mong-joon and Hong Joon-pyo, as they are to play a crucial role in the Seoul race. The party has so far nominated its candidates in 118 out of 246 constituencies.